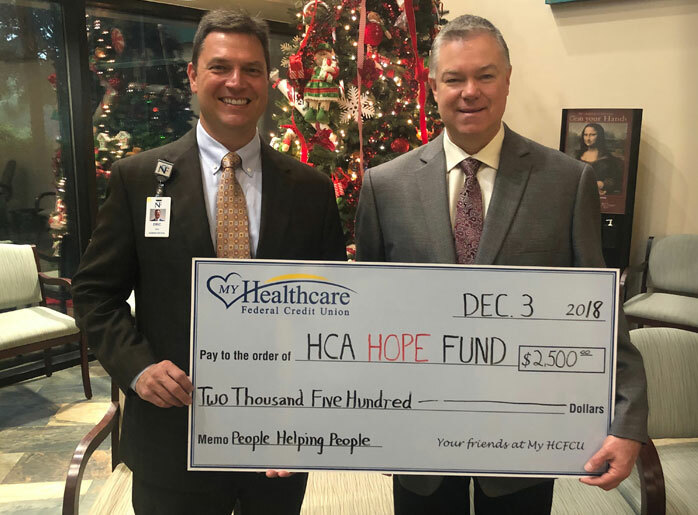 My Healthcare FCU recently donated $2500 to the HCA Hope Fund. We love supporting our local medical community and the wonderful causes they serve! My Healthcare Federal Credit Union is overseen by a Board that is accountable for the general direction and control of the credit union. The Supervisory Committee is appointed to ensure that the credit union policies and procedures are carried out faithfully, and that member assets are protected. The Supervisory Committee, as appointed members, act in an internal oversight auditing capacity for our members. Currently, there is one position available. You may also submit your request via e-mail to bmcmahon@myhcfcu.org. If emailed, subject line should read “Volunteer Application” and the completed form attached. Members have an opportunity to receive a $25 credit to their savings account by referring a medical colleague or immediate family member to the credit union to open a new active membership. Both the current member and the newly referred member may receive a $25 credit to their savings account. Once the member actively uses their account for 90 days, both you and the referred friend will receive a FREE $25 credit to your accounts! Stop into your local MyHCFCU branch to pick up as many cards as you need! Go to www.myhcfcu.org, click on the Refer-a-Friend banner on the Home Page, and print a copy of the card in PDF format. Visit our Facebook page and select the photo of the Refer-a-Friend Card located within our Timeline Photos Album. Print a copy of JPEG image. Only new memberships are eligible. Regardless of the number of accounts opened under the new membership, the new member will only receive $25. The referring member must be a member in good standing to receive the $25 credit. The new member is eligible to receive $25 regardless of the referring member’s status. The new member may receive the $25 credit one time, but then are eligible to receive an additional $25 for each new member they refer. New memberships must remain open a minimum of 90 days. New memberships must be an active account, i.e. have consistent direct deposit, actively using debit card, loan payments, etc. The credit union reserves the right to review and determine if the new membership qualifies as an active account. A $25 credit will be posted to the savings account of the referring member and the new member once the minimum 90 day period has been met. Credits earned will be included on the member’s annual 1099-INT for IRS reporting. Employees and volunteers of the credit union are ineligible to receive the $25 credit. Referrals of new members as part of ongoing SEG new employee onboarding orientations are also ineligible.